The Cocker Griffon is not a purebred dog. 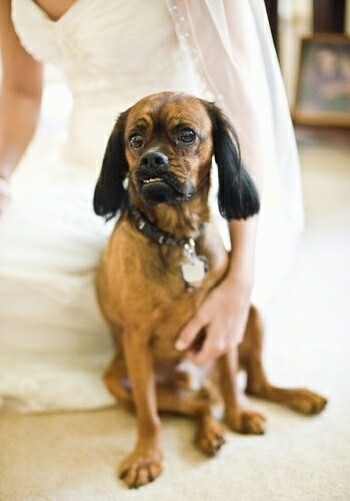 It is a cross between the Cocker Spaniel and the Brussels Griffon. The best way to determine the temperament of a mixed breed is to look up all breeds in the cross and know you can get any combination of any of the characteristics found in either breed. Not all of these designer hybrid dogs being bred are 50% purebred to 50% purebred. It is very common for breeders to breed multi-generation crosses. 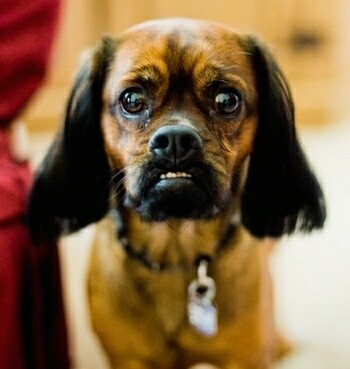 "This is a picture of our Cocker Spaniel / Brussels Griffon mix named Quinn. Quinn was 3 years old when the photo was taken. Quinn is a very loyal and friendly dog. He likes a lot of attention and responds well to discipline. He has picked one person (mom) of the household and sometimes becomes protective of her and has some trouble when mom walks him on a leash with other dogs. On his leash, he feels that he is "in charge" of his mom. Quinn went to obedience training to help with this, which he did excellent with. He needs some reminders on walks, but responds to verbal commands (heal, sit, stay) when other dogs approach. Quinn needs about 30-45 min of exercise a day. A simple walk will do. He is relatively calm in the house and likes to play with squeaky toys on a daily basis. Quinn did have some separation anxiety in the beginning, but grew out of it with consistency and routine. If he is in a familiar place when we leave him, he does well. Once he knows a person and the environment that he is in, he is fine. Quinn is a lap dog, and loves to be near any human that will rub his stomach. When he goes to dog daycare/boarding, he will play with other dogs, but will mostly follow the humans around and try to get their attention. People always comment that Quinn is a "unique" looking dog. His under-bite comes from the Brussels, and the long black ears are from his mom, who was a black Cocker. He has had limited health problems thus far, aside from an occasional ear infection."